Charizard was one of the most popular gen 1 pokemon. Stealth rock crippled it's game battling ability since it looses half it's hp coming out on stealth rock. Thanks to it's hidden ability solar power and vulpix's and ninetales' hidden ability drought it is again somewhat viable in battles. Charizard used to be my favorite Pokemon before Stealth Rock and my new favorite Infernape. 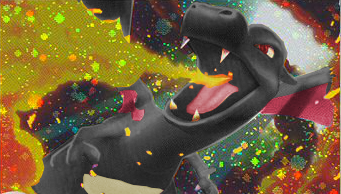 If theres was no stealth rock charizard would be a beast. Charizard is ash's strongest pokemon. Before charizard was disobidient until ash helped charizard when it got frozen by a poliwrath. So you only watched the 1st season? His Charizard wiped out Gary's Golem Scizor and Blastoise all in a row. Yeah that was so epic. It's seismic toss is unstoppable. Not to Golem because Charizard could not lift that heavy thing. Its true he defeated a Articuno using Charizard. To bad he did not use Charizard in the Sinnoh Pokemon Leage if he would maybe he would have defeated that guy with the Darkai and Latios. Its too bad Charizard lost quickly against Spencer in Ash's 3rd attempt at the final frontier battle.